Pictured at the Rotork Fluid Systems factory in Lucca are some of the large linear pneumatic actuators ordered for the Sharq Third Expansion Project in Saudi Arabia. In total, 112 of the actuators were ordered for the operation of gate valves in sizes between ¾” and 30”. 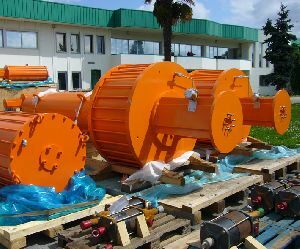 The largest resultant actuated valve packages are over two metres in diameter and five metres tall. Others are specially designed for cryogenic service. Rotork Fluid Systems supplied double-acting and spring-return LP range actuators with a total value of US $3.5 million on the project. The Sharq project will add a total production capacity of 2.8 million tonnes per annum of ethylene glycol to the Eastern Petrochemical Company’s facility in Jubail, making it one of the world’s largest petrochemical sites. Foster Wheeler and Stone and Webster managed the engineering procurement and construction contracts and provided management, co-ordination and control of all phases of the project.